Prospect is a highly sought-after, vibrant, inner-city destination. It is rich in character and local heritage, made more attractive by its facilities, activities, tree-lined streets, and a vibrant arts and events calendar. Prospect’s commercial, retail and hospitality options are equally diverse and desirable, giving you a range of unique, iconic and everyday offerings for residents and visitors alike. Buying your first home is a huge milestone. When you buy a Prospect 1838 townhouse, you’ll have peace of mind knowing you’re living in a brand-new house, selected and designed by you. Prospect is one of Adelaide’s hottest inner-city suburbs, approximately 5 square km in size. In 2011, the population of Prospect was 13,008 people, growing to 13,288 people in 2016. The majority of residents living in Prospect are professionals aged between 20 to 29 years. Make the kitchen the heart of your home with Prospect 1838. Express yourself with stunning Caesarstone benchtops, crafted from robust, low maintenance materials. Your townhouse is built using only the finest quality fittings and finishes. Featuring timeless European appliances, stunning Velux skylights and contemporary stainless-steel bathroom fittings. The Prospect 1838 development is one of Adelaide’s first townhouse projects to design sustainable green walls. The development’s landscaping creates a funky urban space with engaging artworks and community spaces with outdoor barbecues for gatherings with family and friends. Prospect 1838 as a community is incorporating the stories and histories of the local area, in the bike-way wall on the west side of the development. Celebrating the rich history of Prospect, it was decided to incorporate interesting stories and themes of the area's development, as an innovative asset to the community. Eminent Homes is an Australian, family-owned business who have developed properties in South Australia for over 30 years. Located just 5kms from Adelaide’s CBD, Prospect is a vibrant inner-city suburb. 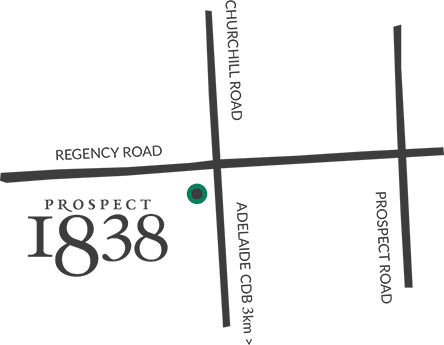 Prospect 1838 is only minutes from the world-class Adelaide Oval and the dazzling Riverbank Precinct. Just short walk from your doorstep, you’ll find a selection of stunning restaurants and bars, parks, playgrounds and countless local amenities conveniently located within the Churchill Shopping Centre including Coles and Kmart. 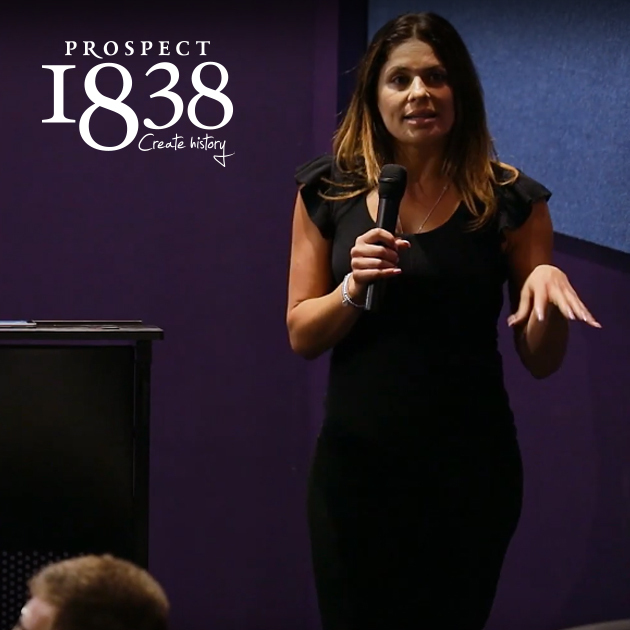 Make your daily commute a breeze at Prospect 1838. Perfectly positioned by Islington Railway Station, just 10 minutes to Adelaide’s CBD by train. On Churchill Road, you’ll find easy bus links, bike tracks and walking trails. 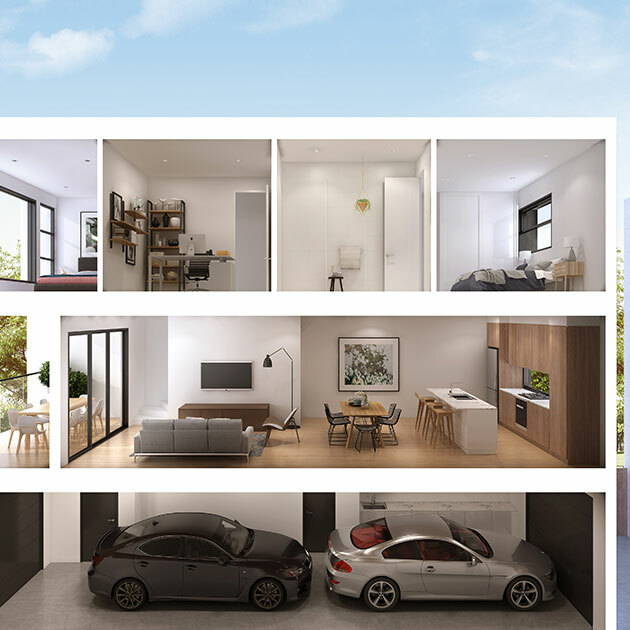 A selection of the state’s most respected schools and universities including Prospect Primary, Prospect North Primary, Blackfriars Priory, Adelaide High and the highly anticipated Botanic High are all within a short distance from your new Prospect 1838 townhouse. Prospect is one of the leading Smart21 Communities in the world, awarded by the International Intelligent Community Forum. 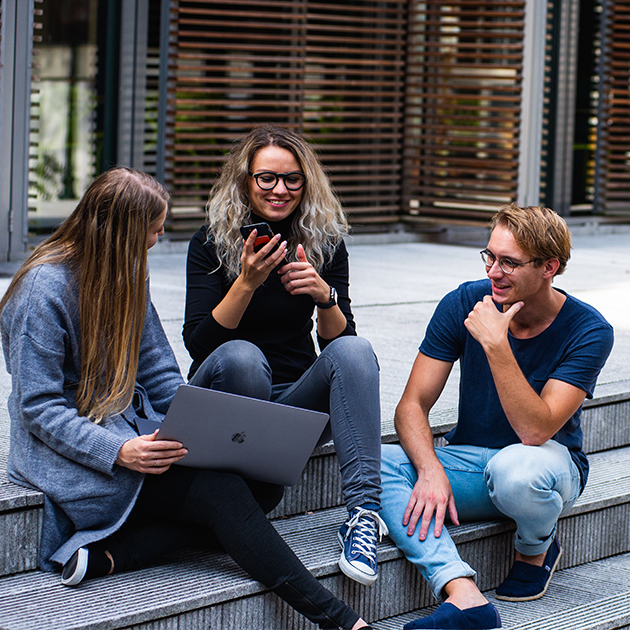 The City of Prospect is internationally recognised as one of the most liveable, connected and progressive centres in Adelaide and will host the first main street GigCity Adelaide connection in Australia. A new Prospectus for investors, ‘10 Gig Reasons to Invest in Prospect’, has just been released and available online; see below. Our business and residential community has embraced the many significant changes that have taken place in our City over the recent years. The creation of an Innovation Precinct is the next step to make City of Prospect the most sought after suburban business and investment centre in the state. View the Prospectus below and get in touch with our team to secure your piece of Prospect. © 2019 All rights reserved Prospect 1838.